At last, here is a book that no girl should be without; a book that guarantees hours of fun; a book that will encourage girls to turn off the TV and go and do something more interesting instead. 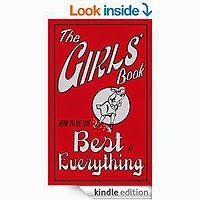 In brief, here is a book that shows readers exactly how to be the best at everything! Who could resist? You can find out how to: keep a message secret; strum a guitar; do a French plait; make a bird feeder; make a compass; find the North Star; press flowers; do finger knitting; build the best sandcastle; make a kite; be a natural beauty; make your own lip gloss; do the perfect handstand; do the splits; teach a dog to shake hands; and much, much more! The entries include step-by-step instructions and diagrams to follow.